Ivory Coast defender Souleymane Bamba has signed a three-year deal to join Italian Serie A side Palermo. The 29-year-old was available on a free transfer after his contract at Turkish club Trabzonspor expired this summer. He told Palermo Calcio TV channel: "I came here and quickly realised the people are very friendly, it's a good feeling to sign here. "I always liked Italian football and I also know Palermo as an ambitious club - which is a great attraction." He added: "The fascination is in the competitive nature of the Italian league. I will give my best and hopefully it will be a good time for me in the Serie A." Born in France to Ivorian parents, Bamba represented Ivory Coast at the 2003 World Youth Championship in the UAE and the 2008 Olympic Games in China. 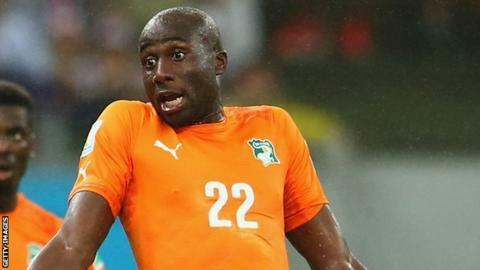 Bamba, who began his career at French side Paris Saint-Germain before spells in Scotland and in England with Leicester City, has also represented his country at senior level. He played in all of Ivory Coast's matches at the 2010 and 2012 Africa Cup of Nations as well as the 2014 World Cup tournament in Brazil.